The practical and reasonable way to explore Bergen, the City of Culture. The Bergen Card is available for 24 hours, 48 hours and 72 hours. With the Bergen Card in your pocket, you travel free on Light Rail and buses in Bergen and the region (not with NSB trains). You get free or discounted admission to museums and attractions, as well as many cultural events, various sightseeing tours, restaurants and parking. You can also travel for free with Bergen Light Rail to and from Bergen Airport Flesland. From the city center to the Airport, the journey will take approximately 45 minutes. You also get 20% discount when travelling with the Airport Bus. Remeber to validate your card before boarding the bus (write the expiry at the back of the card). You can buy the Airport Bus online. Start the day with one of our many sightseeing tours that give you an introduction to what Bergen has to offer. The Bergen Card gives you admission to attractions in the city centre as well as other attractions further out. Bergen has many museums, some with unique art treasures and others that show the breadth of the city’s historical heritage. Take a trip up to Mt. Fløyen and enjoy the view of the city, the fjord and the ocean. See seals, penguins, crocodiles and snakes close up at the aquarium and explore the world of science and technology with your family at the science centre. Round off the day with a meal and a cultural event at one of the city’s many venues. For more information about the Bergen Card, please see visitBergen.com/BergenCard. The card can be picked up at the Tourist Information in Bergen or at the Service center at Bergen Airport Flesland. You must present your booking confirmation (either on your mobile device or a printed copy) when collecting the cards. For student price, please select the appropriate number of adults, then add the discount and complete the booking. Please bring valid student ID when collecting and using the card. You write the time and date on the back of the card yourself. This means that you are free to use the card whenever you like regardless of the time/date you have chosen on your order. But remember that the offers included in the Bergen Card may differ depending on the time of year. PS: Remember that it is the expiry date and time you write on the card, not the start date / time. From October to May many museums may be closed on Mondays. Pay by Visa or MasterCard. The card cannot be cancelled or refunded. But remember, you can use the card whenever you want regardless of the date you have chosen for your order! Advice to jump the line. 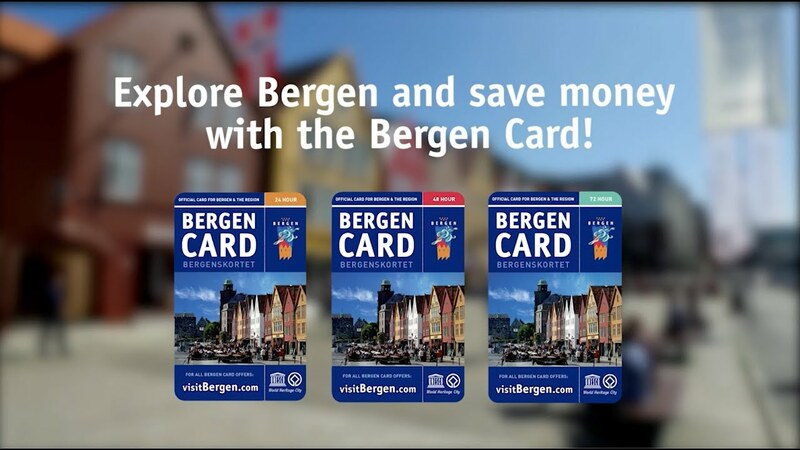 Bergen Card-English - Free admittance or discount to most museums, attractions, sightseeing and more. Bergen Card-German - Freier oder ermäßigter Eintritt zu vielen verschiedenen Sehenswürdigkeiten, in Restaurants usw. Bergen Card 24 hours, BergenExplore Bergen practical and cheaper with the Bergen Card! Enjoy free bus travel, free admittance to most museums, attractions, sightseeing and more! Bergen Card 72 hours, BergenExplore Bergen practical and cheaper with the Bergen Card! Enjoy free bus travel, free admittance to most museums, attractions, sightseeing and more!